Great for familes and groups, this custom log house sleeps 12 on BEDS (not sleeper sofas) and 2 more on a sleeper sofa and 1 more on a couch and is only 50 minutes west of Denver. We have a rec room above the garage (not heated) corn hole, full size pool table, music and giant jenga! We also provide free Comcast wireless internet for your convenience. The Iron Creek Lodge is centrally located in Colorado's premier ski country within minutes of Keystone, Breckenridge, Arapahoe, Loveland (all w/in 15 mins), Copper Mountain (8 mins), and Vail/Beaver Creek (25 mins). Plenty of room and privacy on three levels with 3 queen beds, a double, and four twins plus a full bath on each level. The house also includes a full size baby crib and pack n' play. We also have a stroller, booster seat, toddler toys, books, bouncy seat, exersaucer, play kitchen etc. for the little ones. The house contains two TV viewing areas with stereo, VCR's, DVD players, complete laundry. A large private hot tub on the deck has great mountain views.The kitchen is FULLY furnished; paper goods, kitchen soaps, linens and firewood provided. The home is in a quiet wooded area a half block from national forest access. A Gold Medal trout stream is within walking distance as are walking, biking, and hiking. 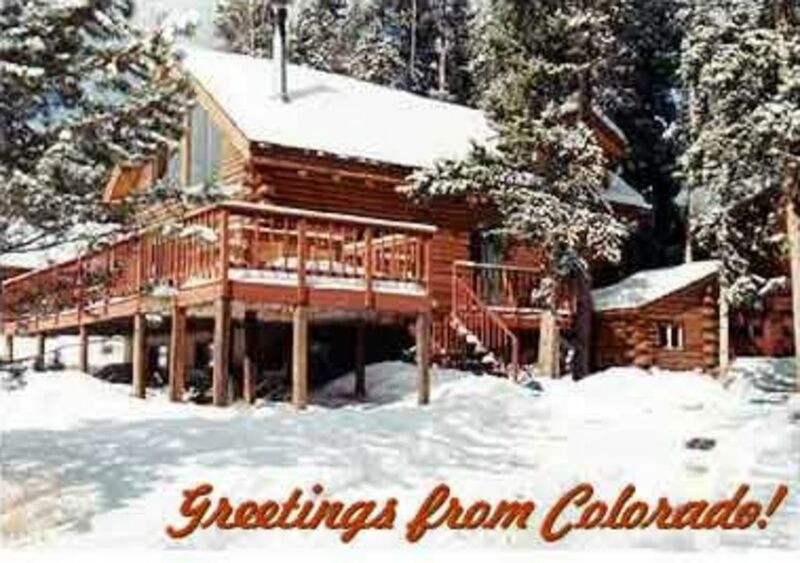 Gollfing, downhill skiing, cross country skiing, snowmobiling, snowshoeing, and the Silverthorne fitness center are all near as are restaurants, museums, shopping, sailing, rafting, and ski equipment rentals. Direct shuttles to the door from DIA possible- lift tickets and rental shops 5 minutes away. On city mantained streets- easily accessible in winter. No Smoking and No Pets unless permission granted, Please. Large Deck with Hot Tub, Terrific Mountain Views, High Speed Wireless Internet, Pot Bellied Stove w/ Wood Provided, Play Area for Children with Books & Play Kitchen, Kids Table and Chairs, toddler toys, stroller, booster chair, exersaucer for baby, bouncy chair, pack n' play, crib, Zoned Central Heat, Phones, 2 Cable TVs (one digital), VCR/DVD, Stereo/CD/Tape Player, Fully Furnished Kitchen(Microwave, Coffee Maker, Blender, Mixer), Paper Goods, Kitchen Soaps Provided, Nintendo Game Cube with Games, Board Games, puzzles, Books, Gas Grill and Picnic Table on Deck, Mountain Lodge Decor, No Smoking & No Pets Please! Very nice place to stay. We skied and went to hot springs to relax. Would recommend. My family and I really enjoyed our stay. The property owner was very responsive to all of our questions before and during our stay. Some of the photos make the interior look a little larger than reality, but it fit all 13 of us nicely. Great location to Dillon & Silverthorne. Easy drive to Keystone, Copper, Breckenridge, Vail and Beaver Creek. We would recommend this place to everyone. Thank you! Cabin is in a great location, close to shops and slopes. Hot tub was a hit with the whole family. Pricing was fair for a larger cabin, we slept 10 comfortably. Cabin could use updating, but has a rustic feel to it, nothing was in drastic disrepair. We were able to enjoy all that we had planned! Overall a great experience. I will start with positives: The property owner refunded our damage deposit along with the cleaning fee. She was friendly and prompt in her replies, sincerely want to help & offered solutions to a towel shortage and also offered to send the cleaning crew back to the house after our unhappy arrival (which simply wasn't a convenient solution with our group already settled in at the property). It's a rustic home with enough spaces for our group to relax after a long day of skiing. The hot tub was serviced twice and we were happy to have it available for our use. The location of the house was very convenient for our activities, and easy to find. The house has amazing potential to be an attractive, cozy log cabin get-away for a group of skiers. I have realistic expectations about what property owners can do for quick turn-around, and I don't expect perfection. But the house was simply very dirty and not well kept for renters. Someone needs to spend a few weeks & give it a good top to bottom cleaning. Upon arrival, we found cookie wrappers on the floor, a prescription pill on the carpet in the middle of the bedroom, really dirty windows, nasty hair on the shower floors, visibly dirty carpet, condoms in the bedside table (!!) and dust, dust, dust everywhere. Poorly lit rooms due to many lightbulbs and lamps non-working and it was a very dark in the house after the sun went down. Although it was great to have a hot tub, getting to it was treacherous as many layers of ice had built up around it, not an inch of clear space to find good footing - tho we managed carefully (desperation). The loft queen bed and the queen bed in the lower level were awful - linens and mattresses need replacing, didn't get a good night sleep the entire time. And, the kitchen-dirty and wayyyy too full of stuff, not an empty cupboard to be found to keep the food and items we brought along. No renter needs 3 blenders, 2 toasters and 4+ drawers of stirring spoons. The left-behind food in the 2 cupboards was unappealing and unnecessary. Again, needs a good cleaning of excess items and sanitizing. I'm sorry we can't give this property a good review - it just wasn't up to standard and we wouldn't recommend staying here until some serious attention is given. I'm sure the property owner will be unhappy about this review, but we base our VRBO rentals on reviews - so I hope this is helpful. We DID enjoy Colorado, however, and will be back to the area. Cleaning fee of $190 (cleaning fee is $250 but owner pays a portion) on rentals of less than five nights. Check in time 4:00 p.m. and Check out time 10:00 a.m. Please contact owner if you would like to request an early check in or late check out and if possible we will try to accommodate if no one is checking out the day of your arrival or checking in the day of your departure.